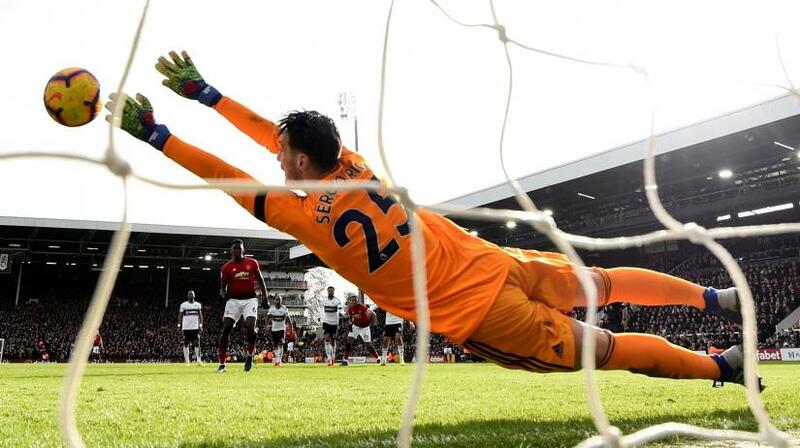 Manchester United rolled to their 10th win in 11 games under caretaker boss Ole Gunnar Solskjaer with a 3-0 win at Fulham on Saturday, climbing into thetop four in the Premier League for the first time since the opening weekend. Paul Pogba fired United ahead from an impossibly tight angle in the 14th minute, springing in behind the defence and onto a pass from Anthony Martial on the left, turning and shooting first time between keeper Sergio Rico and the near post. Their best chance was in the opening minute when Andre Schurrle broke forward and floated the ball across the area and down into the path of Luciano Vietto. The Argentine, however, sent his shot just wide of the far post. United's Belgian striker Romelu Lukaku had an anonymous first half, outshone by his two French team mates. But he helped create the penalty that led to the third goal when he charged forward to pass to Juan Mata, who was bundled over inside the area by Fulham's Maxime Le Marchand. Pogba converted from the spot to put the game beyond Fulham's reach, and was then substituted, most likely to keep him fit ahead of a tough schedule in the coming weeks. United face French champions Paris St Germain in a Champions League last-16 tie, Chelsea in the FA Cup fifth round, and host arch-rivals Liverpool all within the month. The win at Fulham lifts United into fourth place in the league, ahead of Chelsea's visit to Manchester City on Sunday. Pogba appeared happy with the result but remained focused on his side's busy schedule ahead. "The good atmosphere helps the team, and for me, being more in the box gives me more chances to score... There's still a long way to go and we have a lot of big games coming up," he told BBC. Fulham remain in relegation territory in 19th place, and they too have a tough schedule ahead. Yet to win away from home this season, their next three visitors at Craven Cottage are all powerhouses - Chelsea, Liverpool and Manchester City. Schurrle came off near the start of the second half, giving way to Cyrus Christie as the Cottagers looked for ways to get themselves back in the game. But luck was not on their side at all, with Ryan Babel somehow managing to miss a golden opportunity from barely two feet out in the closing minutes, sending Joe Bryan's cross onto the post and out. The crowd, unimpressed at the Schurrle substitution and the very late introduction of promotion heroes Ryan Sessegnon and Tom Cairney, booed Fulham manager Claudio Ranieri off at the end of the match.